The IPCC can accept no liability for injury to persons visiting this site. Lullymore West is a cutaway bog from which peat was commercially extracted in the 20th century. The bog has regenerated to become an important refuge for wildlife. Over 300 species of bird, plant, insect and animal are found here. The variety of habitats on the bog including grassland, scrub woodland, pools and ditches support the biodiversity of life on the site. Lullymore West Bog is one of three properties owned and managed by the Irish Peatland Conservation Council in Kildare. The map below shows the location of Lullymore West Bog in relation to the Bog of Allen Nature Centre and Lodge Bog (north). Lullymore West Bog is part of the great Bog of Allen. The site is located on the north western edge of the mineral soil island of Lullymore, approximately 7km from Allenwood. Land use around Lullymore West Bog includes a coniferous forest plantation to the west and agricultural land to the north and east. 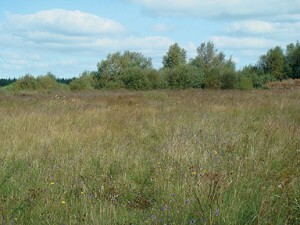 The south side of the bog is privately owned raised bog. Lullymore West Bog was donated by Bord na Móna to the Irish Peatland Conservation Council (IPCC) for conservation in 2005. The image to the left is a surface view of Lullymore West in summer showing the purple flowers of Devil’s Bit Scabious, the food source for the caterpillars of rare European Marsh Fritillary Butterfly. Adult butterflies take nectar from the flowers. Lullymore West Bog is 4.5ha in extent and is being conserved by the Irish Peatland Conservation Council for its diversity of butterflies and moths. With 21 out of the 31 butterflies occurring in Ireland found here and over 150 species of moth, the site is exceptional in Ireland. The endangered Marsh Fritillary Butterfly (Euphydryas aurinia), an insect protected under the EU Habitats Directive is just one of the species being conserved here. 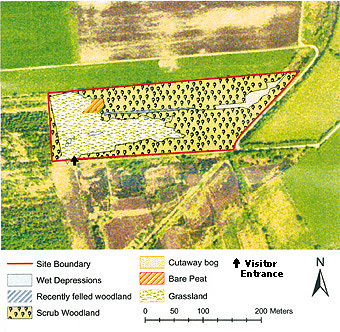 Habitat Map of Lullymore West Bog, Co. Kildare overlain on the air photograph for the site. Different symbols show the locations of the habitats described on the bog. The reserve boundary is in red. Land use around the reserve can be seen including coniferous forestry to the west, grassland to the north and east and privately owned cutover bog to the south. The access point to the bog is shown by the black arrow. Map drawn by Pádraic Fogarty in 2007. The grassland habitat is the most species rich and visually is most stunning in late summer when knapweed, devil’s bit scabious and measdow sweet are flowering among the moor grass giving a very distinct pink and purple hue to the site. On crisp cold bright sunny days in spring, the treelines on the perimeter of the site are stunning when the yellow catkins of willow are seen against a beautiful blue sky. In spring, after the rains, the wet depressions are filled with water. These become alive in March with tadpoles of frogs. In the damp areas, the mosses are very visible at this time especially the orange brown moss Calliergonella cuspidata. The total number of animal species on Lullymore West excluding moths and butterflies is 66. Early in spring green tiger beetles are commonly seen in the cutaway bog habitat. Most obvious in the summer months are the craneflies, hover flies and spit bugs. In early autumn spiders make funnel shaped nests in the grassland and you may catch a glimpse of a female with her egg ball near the nest. The site is rich in moths with 156 species recorded in 2006 by the Moth Society of Ireland from light traps placed on the site overnight. In 2004 Dr Martin Speight discovered a species of Hoverfly at Lullymore West, which was new to Ireland. The species is Eupeodes goeldlini. Dr Speight collected a male hoverfly whilst it was feeding on dandelion flowers during the month of May. The birch and willow woodland habitats are a refuge for bullfinch, chiffchaff, cuckoo, willow warbler, white throat, thrush, robin and gold finch. Thrush anvil sites are commonly seen on the bog where there is rocky mineral soil exposed. Banded snail shells are seen in such areas in abundance. 21 different species of butterfly are found on Lullymore West Bog, out of a total Irish species list of 31. In 2007, IPCC began a programme of butterfly monitoring on the reserve. A 1km butterfly transect has been established throughout the site. Regular walking of the transect is undertaken between April and October. Selection of butterflies found on Lullymore West Bog, Co. Kildare. Photos: J. Harding and C. Krieger. Over 20 species of butterfly are regularly recorded on Lullymore West Bog. 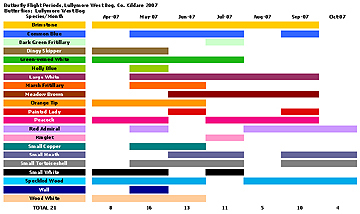 The best times to find each species is shown in the chart below. The chart above shows you when the various butterflies on Lullymore West Bog are in flight. While you watch for butterflies, look out also for the beautiful plants, mosses, insects, spiders and other wildlife found in this reserve. The adult marsh fritillary butterfly (Euphydryas aurinia) on Lullymore West Bog in Co. Kildare. This species is rare and endangered in Europe and is protected under the EU Habitats Directive. Lullymore West Bog is a mecca for butterflies with 21 out of 28 of the Irish resident breeding butterfly species recorded here. Photo: M. Jacob. The grassland habitat at Lullymore West bog is a breeding area for the Marsh Fritillary butterfly because of the abundance of its food plant Devil’s Bit Scabious in the vegetation. IPCC monitor the population of this butterfly in Spring and Autumn each year. The larvae overwinter in webs deep and they emerge on sunny days in spring. For example in the Spring season of 2007 we counted 21 nests of the marsh fritillary butterfly larvae. These had survived the winter period of 2006/2007. In autumn 11 nests of the larvae were recorded which were due to over winter on the bog in 2007/2008. Poor weather during the flight period of June and July, scrub woodland encroachment onto the grassland habitat of the butterfly larvae and the development of purple moor grass into large clumps are all factors that determine population breeding success each year. Click this link if you would like to learn more about the life cycle of the Marsh Fritillary Butterfly. Succisa pratensis or Devil’s Bit Scabious ­ the food plant of the marsh fritillary butterfly was found to be most abundant in the open habitats of the site including grassland, recently-felled woodland and bare peat. In these habitats cover of the plant reached up to 100% of the vegetation. 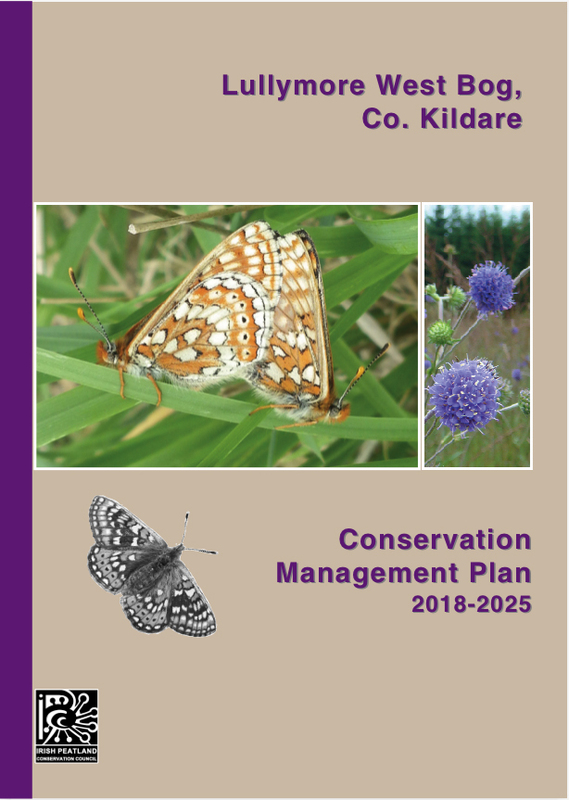 IPCC’s Conservation Management Plan for Lullymore West Bog focuses on the actions that need to be undertaken each year to protect and enhance the butterfly and moth diversity of this site and to raise awareness of the wildlife importance of the bog. Records of wildlife are being kept by the IPCC on an on-going basis, the spread of scrub woodland is being controlled, drains have been blocked and the whole site has been fenced off as a safety precaution. Scientific monitoring of the Marsh Fritillary Butterfly is on-going annually. 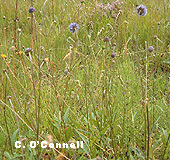 The increase in abundance of Devil’s Bit Scabious, the food plant of the Marsh Fritillary Butterfly larvae is a management priority. A butterfly transect on the site is being monitored each year in liaison with the National Biodiversity Data Centre. To maintain the marsh fritillary butterfly population on Lullymore West Bog and to expand the area of suitable habitat for the butterfly. To ensure that the boundaries of Lullymore West Bog are visible to the public. To prevent harmful human affects to Lullymore West Bog. To increase the Health and Safety awareness of visitors and researchers. To monitor Lullymore West Bog so as to ensure the effectiveness of the Conservation Plan. To encourage further research on Lullymore West Bog and to maintain an archive of research findings. To retain the traditional use of Lullymore West Bog as a training site for surveyors of the Marsh Fritillary Butterfly. To seek local and national recognition of the conservation importance of Lullymore West Bog. When walking on the bog try to avoid trampling ground nests of the Marsh Fritillary Butterfly particularly in Spring and Autumn. surface owing to hidden ditches, soft ground, tree stumps and brambles. The creation and management of the Lullymore West Wildlife Reserve by the IPCC is supported by the following: IPCC’s Friends of the Bog, Kildare County Council, The Biodiversity Fund of the Heritage Council, Volunteering Ireland VOLT Network, Bristol-Myres Squibb Company, Bord na Móna, EOG Association for Conservation, Department of the Environment, Heritage and Local Government’s “Notice Nature” Campaign, KELT and the LEADER Plus Programme which is funded by the Irish Government and part-financed by the European Union under the National Development Plan 2000-2006.